Provides a smooth transition for those already using ECERS-R.
Emphasizes the role of the teacher in creating an environment conducive to developmental gains. Is designed to predict child outcomes more accurately and with greater precision. Provides a stronger method of distinguishing between good and truly excellent programs. Offers a complete training program with ongoing support available at the Environment Rating Scales Institute (ERSI) website (www.ersi.info). ECERS-3 is appropriate for state and district-wide QRIS and continuous improvement; program evaluation by directors and supervisors; teacher self-evaluation; monitoring by agency staff; and teacher education. 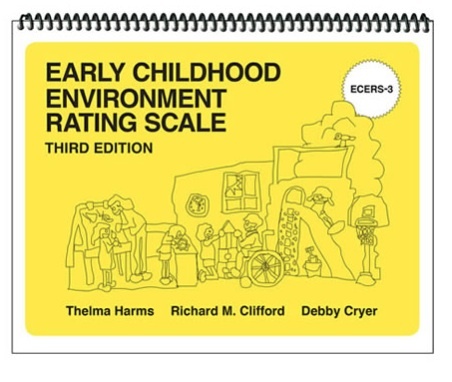 The established reliability and long term evidence of validity of the ERS family of instruments make this new version of ECERS particularly useful for RTTT-ELC accountability and research.